John MacArthur is writing a series dealing with social justice and the gospel (parts one, two, three, and four so far), and I'm focusing primarily on one of them, part three, which his organization calls part two. An emphasis on social justice and tying that to the gospel has invaded evangelicalism. MacArthur says that he could see it coming, but now is when he's saying something about it. I'm happy he is saying something about it. Some would say, look, see what we've been saying, MacArthur deals with important subjects, while independent fundamental Baptists talk about dress, music, and alcohol. He's doing something about the gospel. As anyone reading here knows, we also deal with the gospel here, including where independent Baptists go wrong on it. I've written a lot on it and our Word of Truth Conference has been on the gospel for the last three years, and will be about it this year too. MacArthur has to deal with the social gospel as related to the gospel because it is affecting those with whom he affiliates. I wouldn't need to deal with it at my church at all. That's been clear. In fact, because related subjects, ones that folks would say have nothing to do with the gospel, were ignored, he's now confronting a subject such as this. Evangelicals for awhile have pandered to various constituencies in order to get their crowds. They would say that it's been important so that they could reach these people with the gospel. This is mainstream evangelicalism. They have also kept kicking issues down the road, treating them like their not gospel issues, and then they hit them right in the face as related to the gospel. Evangelicals have been wrong on this. This is not something MacArthur says. He talks about all this like he's had no problem, has had nothing to do with the problem, which isn't true. He's a part of evangelicalism and part of the problem. Before I write more, I want to say that I really like what MacArthur has written in his part three. It's worth reading for anyone and important to understand. I agree with MacArthur in what he's written. I agree with most of the series. I'm on his side in what he is writing. A few things he writes are not exactly right, but I'm with him on the crux of everything that he writes in this series. He's helpful. It's sad what has happened to evangelicalism. Evangelicals as a group have shown an unsettling willingness to compromise or unnecessarily obfuscate all kinds of issues where Scripture has spoken plainly and without ambiguity. The essence of this statement I support, except for one part, that I believe haunts evangelicalism and still MacArthur. This is one of those aspects where he's "not exactly right," to put it kindly. His statement implies that some of scripture is not plain and that some of it is ambiguous. This really is where MacArthur and evangelicals get themselves in trouble and they open the door for denial of the truth and compromise of God's will. Certain teaching and application of scripture is disobeyed, because MacArthur and others like him give their listeners the strong impression that a good number of subjects that have been clear in the past to Christians, really are not. I know MacArthur would confess to support the historic doctrine of perspecuity. If pushed, he only goes so far as to support perspecuity as it relates to gospel related subjects. He is saying that the Bible does have plain and non-ambiguous statements, but with his implication that it has some that are not plain and are not ambiguous, he opens the door for professing Christians to do what they want, even on the subjects that he addresses. Nevertheless, MacArthur says the truth about certain subjects, the ones that he says are plain and without ambiguity. From my reading through the years, with him and some of his associates, the subjects that are without ambiguity are the ones he says are without ambiguity. However, certain subjects have not been with ambiguity until in the last century, and those are ones that MacArthur himself says are ambiguous. His capitulation on some of those have led to many of the issues that he's concerned about, like the strange fire of Charismaticism, the pragmatism everywhere in evangelicalism, and the role reversal. What I've read in the past is that some of the above are just non-essential. Some of these are not gospel, so when is it essential, or non-essential? Now I'm getting that something is essential when it is "plain" and "without ambiguity." I'm just happy some evangelicals are concerned. One common theme within independent Baptist fundamentalism around the English version issue is that no one should divide over it. The concept here is that anyone or any church should be able to use whatever version they want without another person or church dividing over that. Many want it in some official capacity not to be worthy of separation. The edict comes from above that no one shall separate. The problem then is separating. That's causing division or as it is often put, heresy. People who divide over the version issue are heretics. You've got to allow the difference as though it is almost nothing. For a long time, one would only hear the "don't divide" mantra from the modern version side. Its proponents were concerned over what they called "heresy." "Don't divide" was a kind of argument that would give them more freedom to use the modern version and yet keep fundamentalism together for whatever reason, maybe some kind of faux ecclesiological issue. Only King James Version advocates would divide over the translation someone used, making them with this chief guideline, the boogeymen. The "no divide" side has looked to me as the "biding our time" side. They have assumed that support for the King James Version would erode and they wouldn't have to keep putting up with it anymore. Some KJV men went along with this perspective. I saw this mainly from Bob Jones University graduates, which included Ambassador Baptist College and Ron Comfort, and then Wayne Van Gelderen and Baptist College of Ministry. A major component of these representations of fundamentalism was be gracious and don't divide over this subject or doctrine. This continues to be a component of independent Baptist fundamentalism. Now I'm reading that it's time to divide. Mark Ward has given a reason -- readability. He found 1 Corinthians 14 and announced it was not a Christian liberty issue anymore. It hasn't been picked up yet by the "no divide" side of things, because they would have to come up with a new edict, that says division is now the right position. I've already said that this issue is worth division. It doesn't mean I'm not thankful for all of the good conservative qualities to independent Baptist fundamentalism. Our church divides over the doctrine of preservation. First, the doctrine of preservation needs itself to be preserved and separation is the means of preservation. Second, the destruction of the doctrine of preservation will result in the destruction of scripture itself. Third, the destruction of the doctrine of preservation takes away from the authority of scripture. Fourth, the destruction of the doctrine of preservation relates to the integrity or veracity of God. He said He would preserve every Word, so it reflects on Him. He isn't a liar. Those are why our church separates. In order to preserve scripture and preserve the truth itself, we have to separate to do that. The FBFI has followed its first article at Proclaim and Defend with another one, perhaps in reaction to criticism, tracking the resolutions the fundamentalist organization has made in its history against KJV Onlyism, entitled, "The FBFI and the Text and Translation Debate," by David Shumate. It's a handy summary of what the leaders of the FBFI concluded on the subject from 1979 to 2008 at various junctures. Independent Baptist fundamentalism has had camps, divided mainly between those proceeding from Bob Jones University and its orbiting institutions and the Sword of the Lord types and its related offshoots. Those two branches have held different positions on the King James Version. From early on BJU was influenced by graduates of evangelical seminaries who embraced modern textual criticism. Dominant revivalist preachers, big personalities, charismatic figures kept many large churches and the several colleges they spawned into the King James Version, mainly with what I call an English preservation position. At the root of the latter, however, has always been a desire to believe in the preservation of scripture, even if it isn't a biblical sustainable edition of the doctrine. I attended a fundamentalist college and seminary, Maranatha, in Watertown, Wisconsin, that took a presuppositional position on the preservation of scripture in the original languages, and the graduates used the King James Version. Maranatha didn't follow the path of Bob Jones or take the traditionalistic explanation of Southern revivalism, but it was concerned with the original languages. It focused first on the teaching of scripture, historic doctrine, and the writings of such men as Dean Burgon and Edward Hills. The founder and president, B. Myron Cedarholm, led in this, which continued at Maranatha until he retired and Arno Q. Weniger took his place. The textus receptus was replaced with Nestles-Aland in Greek class. Weniger never believed the same as Maranatha and took it a different course, one celebrated by the BJU faction of independent Baptist fundamentalism. When I was England earlier this summer, I witnessed a rich history of defense of the historic doctrine of the preservation of scripture. These were men in the trajectory of the London Baptist Confession and its bibliological teaching. The Trinitarian Bible Society still stands in the U.K. for the historic and biblical doctrine of preservation, quite separate from whatever has been happening across the ocean in the United States. It prints and sells many copies of the textus receptus. What I'm describing above is the division in independent Baptist fundamentalism that David Shumate addresses. Bob Jones University has been more of an outlier among independent Baptists. BJU and its graduates have been highly influential in Baptist fundamentalism. Thomas Overmiller, whom I referenced in part one, and will again in this post, graduated from Baptist College of Ministry, which has been led by the Van Gelderen family, who are Bob Jones graduates. Wayne Van Gelderen Jr. is also on the FBFI board. They haven't been strong against eclecticism and modern versions, but have viewed this issue as merely preferential, nothing to divide over, as I addressed earlier. As a bit of a side note, but worth noting, has been an internal influence of preservation of words, and, therefore, King James Version, around Bob Jones University, mainly through the connection with Ian Paisley. Back in the day, Paisley came to BJU and he was different on this issue than Bob Jones, and yet he was a favorite there. That translated to other influential leaders, like Rod Bell, longtime president of the FBF, now FBFI. Bell believed like Paisley. That faction existed in the Bob Jones crowd. What is more important, keeping all of the various factions together and for what purpose? Or is it doing our part in the preservation of scripture and also preserving the doctrine of preservation? The two different bibliologies cannot both be true. They shouldn't coexist. I come back to Overmiller's instruction on preservation passages. He's got a lot of work to do to explain away multiple preservation passages. Overmiller categorizes Matthew 5:17-18 as teaching preservation of scripture directly. Then he contradicts that in his short paragraph about these two verses. He says they may or may not even be about preservation, but about "the unchanging authority of the Old Testament in every detail." It's hard to understand what Overmiller is saying, especially in light of what the actual verses say. There is a simple, plain understanding of Matthew 5:17-18. I agree that the "jot" is the smallest consonant, the yodh. The "tittle," keraia, through history was understood then as a vowel point. A newer position is that it is just a part of a letter, so jot is the smallest letter and tittle is a part of a letter that differentiates it from other letters. Heaven and earth are going to pass. That is not symbolic. However, until they pass, not even the parts of words will pass away. Nothing in the law, which is shorthand for the Old Testament, as is the law and the prophets, will pass away until everything in it is fulfilled. This is not metaphorical language. Heaven and earth are heaven and earth and jots and tittles are jots and tittles. This teaching from Jesus goes right along with all the other passages on preservation. The words of the original language will be preserved, right down to the letter. Overmiller says that Isaiah 40:8 doesn't teach preservation of scripture. It's very much like Matthew 5:17-18, comparing the temporal existence of something to the eternal existence of something else. Grass and flowers wither and fade, but not the words of God. He says it can't mean preservation, because there are unwritten words that God did not say that He did not preserve. Who in the history of Christianity has believed that preservation of scripture refers to anything, but God's written word, not all of the words that He ever spake that are not recorded in scripture? This is nothing but a straw man. God's covenant with man is always written, the Old and the New. They should not be separated from one another like the Marcionites. They are the same message, progressively revealed in time, albeit forever settled in heaven. Grass and flowers are tangible. Heavens and earth are tangible. Written words are tangible. The former passes away, the latter continues. To make the latter intangible, spoken words that would not be preserved like these tangible things, doesn't fit the parallelism. Again, Overmiller defies the plain meaning of the text. He says it can't mean preservation, because spoken words of Jesus were never preserved. That is reading something into the text that isn't there. Jesus' words "shall not pass away" is very straightforward. The whole eschatological section in Matthew 24 indicates the temporality of heaven and earth as God's judgment comes, but His words will survive all of that. Yes, you can always count on His words, because they will always be there, unlike heaven and earth. We should prioritize His words, because they will last. Overmiller writes that this verse is not about preservation. When you read it in its context, it is even more convincingly about preservation. How is scripture broken? A prophecy was made in the Old Testament about Jesus based upon just a few letters, a singular instead of a plural. That argument could be made because the line of the very writings of the Old Testament found in even letters could not be broken. The singulars or plurals of words would continue unbroken. Overmiller muddles the teaching of preservation here too. In this section, Peter uses the word for particular portions of scripture, rhema, and the one that would refer to all of the Word, logos. They would endure, both of them, the portions and the whole Word, forever. Corruptible seed is seed that rots and disappears. Incorruptible seed remains. Fleshly physical things will not continue, but God's Word will. There are more passages Overmiller mentions, and I'll be coming back to them, perhaps early next week. However, there are quite a few other passages that teach the doctrine of preservation that he left out. We can and should know that scripture teaches its own preservation, down to the smallest letter in the original language, that is, what it was written in. If you asked the typical people in the pew whether God preserved all of His Words, saved people, they'll say, yes. A major reason is because the doctrine of preservation is all over the Bible and they also know that is the nature of the one true God. It is preachers who start with textual criticism, who also cast doubt and uncertainty on God's Word that leaves people in doubt. Just normal, average Christian, no scholar, can see that the Bible teaches its own preservation. What we know about God and His will comes from His speaking about Himself and what He wants. What we know about the Bible itself we get from the Bible, whether that be inspiration, authority, canonicity, sufficiency, or preservation. Our position on preservation of scripture should be the biblical one. The biblical one would also be a historical one. If a position on preservation is different than what the Bible teaches and what Christians historically believed, that is the one that is confused or heterodox (not orthodox). For myself, I'm open to the idea that I'm wrong about preservation. I'm willing to go back to the drawing board on this. If I'm wrong, I need to be shown scripture, but almost never am I shown scripture (I don't remember ever). Even if it comes with a bit of mockery, I would take that in order to be corrected by scripture. Instead, I just get the mockery and not the scripture. The former doesn't serve to convince me. My issue with modern versions is that they come from a different text of scripture, even the New King James Version. I am not ready to embrace other modern translations of the same text as the King James Version. I believe that scripture teaches perfect preservation. I haven't been shown the Bible teaching something different. Saying the Bible teaches something less than perfect preservation is diverging from a biblical and historical position. I'm not fine with that. What's curious to me is how that men don't mind taking a position that is different than one that is biblical or historical. I understand the most conservative position of those who do not believe in perfect preservation of scripture is that all the words are somewhere on earth in an available manuscript. We just don't know what they are. I don't see that position reflected in the Bible. My faith comes from scripture, so I reject that position. It won't convince me to call that confused or heterodox. I don't believe it and no one has proven it. They assert it without proof. It seems more like propaganda or an attempt to receive applause from a particular crowd. If people are going to live according to scripture, they have to believe it is scripture, not maybe scripture. If we aren't sure we have what God said, why would anyone do the hard thing of doing it? It's a major reason why there is a precipitous drop in obedience to scripture in numbers of areas. The Bible has lost its authority, in part because people are not sure about it. It is way more damaging than Mark Ward's "false friends" and "dead words," that criticize translation. What spawned this post was a series of unfortunate events. The first I wrote about almost a month ago, Mark Ward's address to the Fundamental Baptist Fellowship International Conference. Mark said that the sole usage by a church of the King James Version of the Bible should result in separation by FBFI churches, because of a violation of a very strained application of 1 Corinthians 14, that requires several leaps to arrive at this severe censure. It is not the nature of most of the type of churches of which Ward approves to stretch application of the text to this degree. I can't think of a single example of a similar practice. The Gospel Coalition, where Mark made an appeal, itself welcomes continuationists, who don't mind unintelligibility in the form of tongues, an actual direct violation of 1 Corinthians 14 -- no call for separation from Mark though for the cool guys at TGC. He veers off the road past the sidewalk into back yards to pick off those who still use the King James Version. I'm fine with separation. I would expect a better basis or explanation. I've said, if Mark's right, let's change. I believe it. I'm happy to follow scripture. But second, the FBFI, who had invited Mark in the first place, somewhat walked back his invitation and the content of his session by authoring a post at their online publication, Proclaim and Defend, entitled "FBFI and the KJV," by Kevin Schaal. I had already mentioned that I didn't think that anyone in Mark's audience actually, really believed his farfetched application of 1 Corinthians 14. I would suggest for anyone at least first believing and practicing 1 Corinthians 14 before someone starts with novel applications. Then third, something akin to Tolstoy's War and Peace breaks out at professing fundamentalist forum, SharperIron, to deal with this "unimportant" issue (almost always how they refer to it) with at present, 103 comments, an anthology now past the length of a theological treatise. I've been mentioned four or five times in the discussion, sometimes, as usual, misrepresented (sometimes I want to guest comment there to clear up the misrepresentations or at least have someone post my comment). Biblical evidence indicates that God preserves the words of scripture within the many ancient manuscripts that remain in the world today. He provided no basis for this position which is the crux of this issue, the preservation of scripture. Mark Ward wants to turn the version issue into readability, where that must be the issue and nothing else, and most others don't provide any biblical basis at all for a decision. Overmiller uses one of his articles to treat the doctrine of preservation, but he doesn't make a connection with those passages at all to his conclusion. For the most part, he attempts to explain away the doctrine of preservation while referring to preservation passages. The position that was generally or traditionally accepted as right or true, established and approved, the one believed and taught from the Bible is not the one believed and taught by these men using the word "orthodox." They don't give me a means to believe what they want me to believe. The new position is the unorthodox one. There is a line of truth and it veers off of it before establishing from scripture why to do that. The people who are confused are the ones who don't understand scripture, the ones who have had new or alien teaching draw away their minds from the teaching of the Bible. Very often confusion comes from material external to scripture and virtually everything that buttresses the modern version or an eclectic text position originates from outside of the Bible. It also confuses people as to the certainty of scripture. The right view of the doctrine of preservation would not find a problem with a new translation. Just because someone wants to keep using the King James Version doesn't mean that he thinks that every one of those words are the only way to translate a particular word. The impetus for a new translation from the Hebrew Masoretic and the Greek textus receptus, the text behind the King James Version, will come from the churches that use that translation and want a new one. I preached the gospel to a youngish Roman Catholic woman this week, the entire gospel, for over an hour, at the end of which she seemed convinced of what I told her utilizing numerous verses from the King James Version. Hispanic in ethnicity, she absolutely understood it, and she had no scriptural background. This occurs about every week. The Bible provides us with helpful perspective about what to expect regarding the continuation [sic] God’s written words in the world throughout history. This is especially important to understand because the original manuscripts themselves are not available. Those two sentences don't seem to be directing someone to the Bible's teaching on preservation. They do not rely on what scripture says to frame the teaching. The original manuscripts not being available itself is not a teaching of scripture. Preservation is not dependent on possessing them. He first points to Psalm 12:6-7, which he doesn't even believe teaches preservation of scripture. Overmiller either doesn't understand Hebrew or he is playing off the ignorance of his audience. Masculine pronouns do refer to feminine nouns in the Hebrew and especially as they relate to scripture (read here). He leaves this point out. Gesenius's Hebrew Grammar states that "masculine suffixes are not infrequently used to refer to feminine substantives." There is a strong argument, especially in the psalms that you would expect the pronoun to be masculine that refers to feminine "words." Plain reading of the passage reads as though it is teaching preservation of scripture. The whole argument on preservation isn't buttressed by those two verses, but they should be included as teaching on the preservation of scripture. It is an odd article that claims to be teaching on preservation and starts by explaining how a passage doesn't teach preservation of the words of God. This is not uncommon for modern version advocates. They look for ways to explain away what God's Word says. This is confusing and unorthodox. Overmiller next deals with Psalm 119:89, which reads: "For ever, O LORD, thy word is settled in heaven." He says that again is not teaching preservation -- "it doesn't speak about preservation at all" -- but that God's Word is unquestioned and authoritative in heaven. At one point and in a wrong way among his eight essays, Overmiller speaks well of the Septuagint Greek translation of the Old Testament. In the Brenton edition, natsab, the Hebrew word translated "settled" in the King James Version, is translated with the Greek word, diamenei. The Hebrew scholars that translated the Brenton edition of the LXX said that "settled" means to "remain, continue." God's Word remains or continues in heaven. It is eternal and perpetual, neither can it be vacated or abolished by the injury of time or endeavours of tyrants. The Bible was imprinted at the New Jerusalem by the finger of Jehovah, and shall outlive the days of heaven, run parallel with the life of God, with the line of eternity. It isn't that we can't get more from this verse than preservation, but that it at least teaches preservation, or adds to what the whole Bible teaches about its own preservation. To say it doesn't teach preservation at all, but that it refers to "authority" instead, as Overmiller says, just seems like a deliberate misrepresentation. Acid washing preservation from scripture will not justify before God a lax approach to God's Word. In the next passage, Psalm 119:152, 160, Overmiller says these passages teach preservation, however, in my opinion attempting to downgrade the preservation teaching by saying they teach the preservation of the Torah. They apply to all of God's Words. Overmiller should know that in Psalm 119:152, a masculine pronoun "them" refers to a feminine noun, "testimonies." That can't occur, right? This is his whole point from Psalm 12:6-7 and one that is sandblasted by Psalm 119:152. Everyone should take this into consideration. The teaching from Psalm 119:152 and 160 is consistent with what the Bible teaches about its own preservation. It is regular and often. This is why so many people assume that God preserved every word, only to have that undermined by preachers, who have been duped by a rationalist approach. Lord-willing, I'm going to come back tomorrow to deal with the rest of Overmiller in this section, where he claims to show what the Bible teaches about its own preservation. I look forward to it. 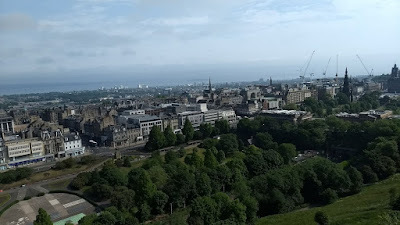 When we arrived to our flat in the area of Leith in Edinburgh (pronounced Edinborough) on Friday, June 8, we moved in, and I went around the corner to a city grocer's to pick up some food for the next few days, especially for breakfast. We did this everywhere we stayed for a few nights -- so far in London, when we were there from the first Wednesday night to the following Wednesday morning, and now Edinburgh, where we would stay until early Monday morning. I pre-purchased most of our tickets before we left California, which allows skipping the lines at almost every place. Usually this means you have to arrive at a scheduled time for your visit, which we did Saturday morning, June 9. It's about a 25 minute to the center of Edinburgh and the castle opens at 9:30am. The castle is at the end of what Edinburgh calls the Royal Mile, the main street of its old town. One can easily spend the entire day or more between Edinburgh Castle and the Royal Mile. 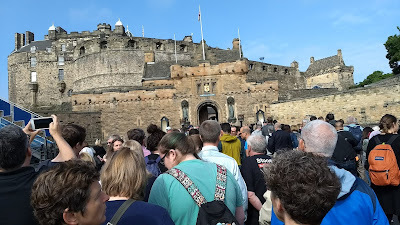 From the bus stop, we zig-zagged our way together up to the castle, the most distinguishable emblem of the country of Scotland, that dominates the skyline of Edinburgh. It was a gigantic line that we skipped past because we didn't need to buy tickets. 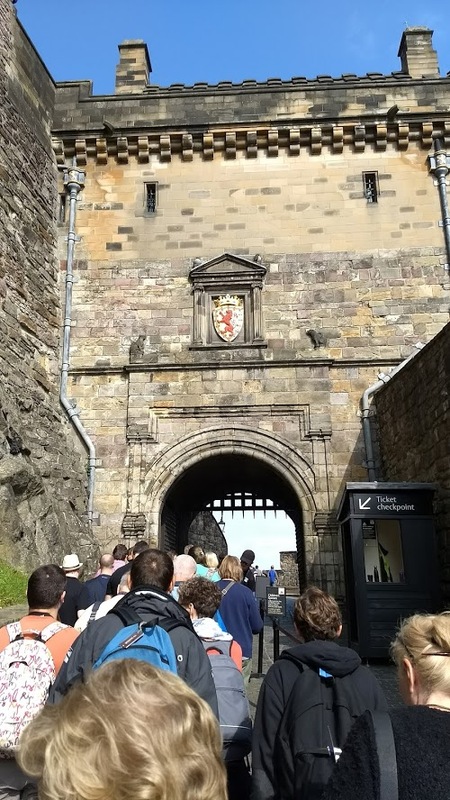 The entrance gateway is flanked by statues of Robert the Bruce and William Wallace, that open to a cobbled lane leading to a narrow tunnel ending with a metal portcullis gate, which dropped in front of the castle in the case of attackers. By the eleventh century AD it was established as the principle royal residence in Scotland. 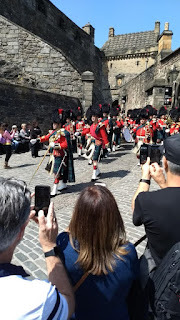 Now it houses the Royal Regiment of Scotland and the Royal Scots Dragoon Guards, St. Margaret's Chapel, the oldest building in Edinburgh, and the Scottish Crown Jewels. What stood out to me is it's high position on volcanic rock with an amazing view of Edinburgh and beyond, including the Firth of Forth, and the very birth room of King James VI of Scotland (King James I of England), to Mary, Queen of Scots. We visited the day of the celebration of Queen Elizabeth's birthday. The band of the Royal Regiment of Scotland played, along with bagpipes. They fired a 21 gun salute to the Queen with three 150mm howisters. 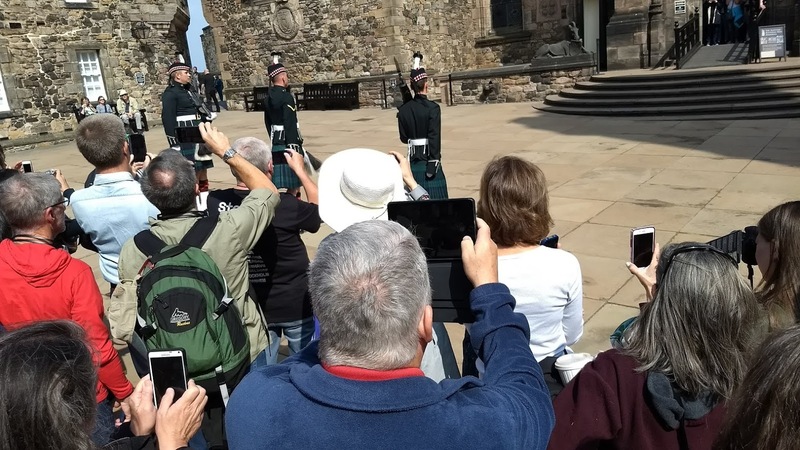 We also viewed the changing of the guard. The royal mile is an almost exact mile between the castle and Holyrood Palace. 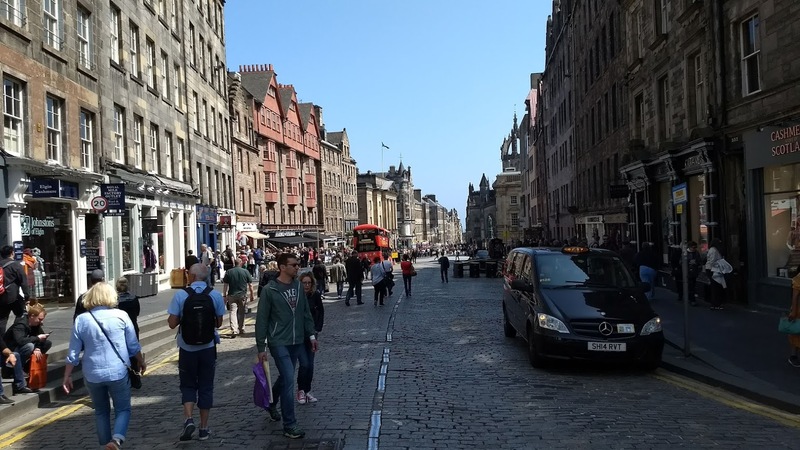 Not only is the royal mile crammed with interesting shops and historic sites, but also some of its famous side streets. 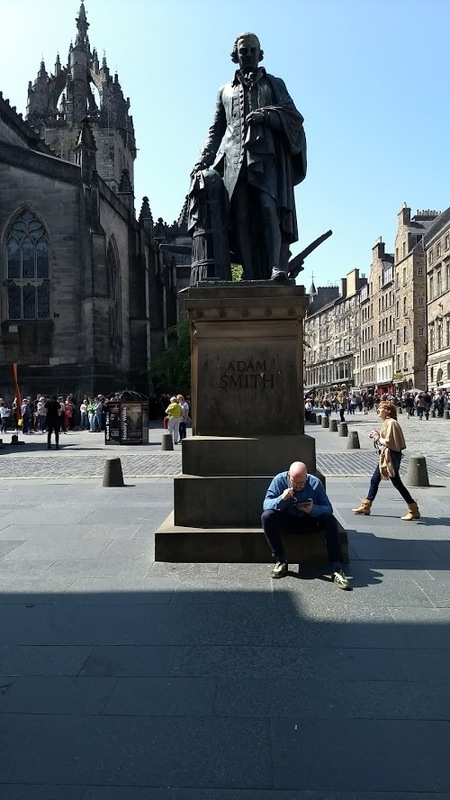 There is an impressive statue there of a native son, Adam Smith, the economist who wrote The Wealth of Nations. He also lived on that street for a time. The Scottish Parliament is on the royal mile. The house of John Knox is there, and can be toured, the Father of the Scottish Reformation. I visited a cemetery that also had the grave of several well known Scots, including Adam Smith, but I was interested in the tombstone of Horatius Bonar. The street performers were talented and funny. We stopped for coffee at Cafe Nero, a competitor of Costas in the U.K. We visited many, many shops with lambswool or cashmere scarves, wool being a major industry in Scotland. 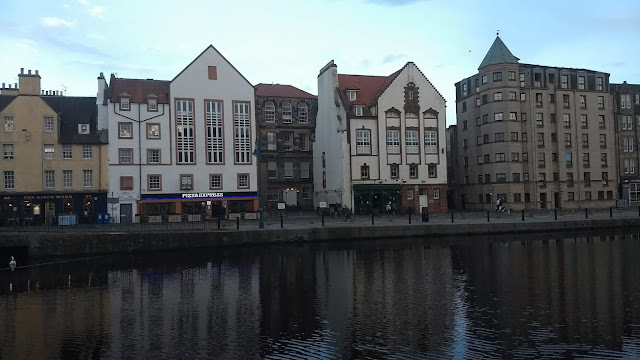 We finished the mile about 5pm and took the bus back to Leith. We ate pizza at Pizza Express, right next door to our flat. On the other side of the restaurant is a tavern called the King's Wark, which was an original royal residence and armory for King James I, and a sign marks this reality. After all, at the heart of the Keswick theology is the idea the blessings of Christ’s death are inactive until they are especially appropriated by a distinct act of faith. Thus, since “all the fruits of the sufferings of Christ ought to be obtained by faith,” the believer who has entered into the Highest Life of the Higher Life rises up and is “CONQUERING DEATH BY FAITH,” guaranteed not to suffer physical death but to be raptured by a specific act of faith to that end. Only when, being already justified, one exercises a specific act of faith to activate sanctification does he receive this second blessing. (To affirm otherwise is to return to the despised orthodox, non-Higher Life doctrine.) In exactly the same fashion, one will not partake of the Rapture without a specific, post-sanctification act of faith toward that end. Indeed, on this Keswick view, God is so unable to Rapture those who do not specifically exercise faith in this regard, that after the first group ascends, other groups will be left for Tribulation-period Rapture—but only as they enter into the Translation plane of the Throne Life. First, at the initial Rapture, those with the Highest Life will rise “in the air just above our planet,” where they will be judged while the Tribulation proceeds on earth. Those believers who were left behind would then “ascend to Him” in little “after companies” as they finally grasped, as the Tribulation period continued, the truths taught in the inspired writings of Mrs. Penn-Lewis, and were purified enough to ascend to join their brethren in the air above the planet. A group would go here, and a group there. As one explanatory article in The Overcomer magazine relates, the “Parousia of Christ means His Presence in the air just above our planet, where His saints will gather unto Him . . . in successive Translations during the period of Tribulation on earth which will culminate in Armageddon.” That is, as believers who missed the initial Translation enter into the Throne Life, “[f]rom time to time various companies of saints who were not ready for the first Rapture [will] disappear from the earth and join their fellows.” Since to be raptured it was essential to have the Translation Faith truths taught by Mrs. Penn-Lewis, and nobody could discover these truths simply by reading the Bible, Mrs. Penn-Lewis wrote an article describing how one was to enter into the blessing of Translation faith. In it she described “how to get it, use it, and keep it,” so that Highest Life Keswick Christians do not fall back to the lower plain of the non-elite people of God, all of whom miss the Rapture. The Overcomer, December 1914. At first Roberts was less specific, simply prophesying that Christ would return in his lifetime (pgs. 196-197, An Instrument of Revival, Jones) and then predicting that Christ would return in under a decade (pg. 177, The Overcomer, December 1913). Finally, 1914 became the specific year in which the Translation would take place. Perhaps Roberts believed he had an “intimation of the summons” to heaven in the Rapture that G. A. Pember spoke of (pg. 195, Earth’s Earliest Ages), although such an intimation is Biblically impossible (Matthew 24:36). Pentecostals were reprinting Evan Roberts’s prophecy—the earlier version that Christ would come in his lifetime—for decades (cf. the reprint of Roberts’s false prophecy on pg. 5, The Pentecostal Evangel, 1681 (July 27, 1946). The Pentecostal Evangel was the official periodical of the Assemblies of God denomination.). For obvious reasons, Roberts’s prophecy that Christ would return in his lifetime was more easily propagated after 1914 than were his date-setting prophecies. “Prepare!” by Otto Stockmayer, pg. 185 in The Overcomer, December 1913. Mrs. Penn-Lewis had Stockmayer’s article printed immediately after her record of Evan Roberts’ Translation Message. Penn-Lewis’s argument for the partial-Rapture of the “Man-Child,” so that to “have part in the rapture we must be sanctified and holy and live the life of a full overcomer,” was proclaimed in almost identical language by Pentecostalism (cf. the detailed exposition on pg. 2, The Apostolic Faith I:12 (Los Angeles, January 1908), reprinted on pg. 50, Like As of Fire: Newspapers from the Azusa Street World Wide Revival: A Reprint of “The Apostolic Faith” (1906-1908), coll. Fred T. Corum & Rachel A. Sizelove; see also pg. 4, The Apostolic Faith I:10 (September 1907), reprinted on pg. 44, Like As of Fire: Newspapers from the Azusa Street World Wide Revival: A Reprint of “The Apostolic Faith” (1906-1908), coll. Fred T. Corum & Rachel A. Sizelove & pg. 1, The Apostolic Faith I:11 (October-January 1908), reprinted on pg. 45, Like As of Fire: Newspapers from the Azusa Street World Wide Revival: A Reprint of “The Apostolic Faith” (1906-1908), coll. Fred T. Corum & Rachel A. Sizelove). The identification of full overcomers who are ready for the Rapture with only those who have spoken in tongues (pg. 2, The Apostolic Faith I:5 (January 1907), reprinted on pg. 18, Like As of Fire: Newspapers from the Azusa Street World Wide Revival: A Reprint of “The Apostolic Faith” (1906-1908), coll. Fred T. Corum & Rachel A. Sizelove), however, would not be followed by Penn-Lewis. “Prepare!” by Otto Stockmayer, pg. 185 in The Overcomer, December 1913. Italics and capitalization in original. Can you sense the presence of God? If so, how do you sense the presence of God? Furthermore, is it even necessary to sense the presence of God? Why does it matter? I've been in meetings where the leaders of the meeting say they sense the presence of God. I have heard reports of meetings from men saying they sensed the presence of God. I've read missionary letters in which the missionary reported as being in a meeting where he sensed the presence of God. In almost every occasion, it is someone who felt the presence of God, so it's predominately, as I have heard and read, a feeling. When I was younger, because I heard the above types of statements, I wanted to feel the presence of God or understand how someone could feel His presence. On a regular basis, other people with great confidence said that they could feel God's presence in their life. I thought I must be missing out on that, because I didn't feel it. Sometimes I prayed to God that I would feel his presence or know that His presence was in my life. After I prayed that, I looked for some kind of sign that it was true, a feeling of some kind. I started to interpret sensations as His presence, not knowing whether they were His presence or not. All of this was because others had said it was something I should expect. This is a favorite of revivalist southern gospel quartets. It exacerbates this yearning for a feeling of God's presence or a sense of His presence that is subjective and mystical. When I read through all of the verses, I don't think the contents are taught in scripture. The message of the song clashes with the teaching of scripture. God promises to abide with us, if we are saved. No man can pluck us out of His hand. We couldn't be closer to Him and we don't need to pray for His abiding or think that we could miss it. Perhaps the centrally 'romantic' hymn of all hymns is the intensely personal yet, as it has proved, wholly universal hymn, 'Abide with me.'" He calls it a "romantic hymn," which is a product of a period, not scripture. In addition to the language of "sensing God's presence," I've furthermore heard men announce that they had prayed for "God to come down" or "asked God to be with us in a special way." In 1 Kings 18, fire comes from heaven in answer to Elijah's prayer that burned up the "sacrifice, and the wood, and the stones, and the dust, and licked up the water that was in the trench." Sometimes I've heard the prayer for God's presence is worded like "fire coming down." The Shekinah glory of the Lord came down in the newly dedicated temple of Solomon. These occasions in the Old Testament are not normative for today. David could lose the Holy Spirit, because the Holy Spirit was upon him in a unique "upon ministry" (not "in") of the Holy Spirit for his service as King of Israel. It was symbolized by the anointing with oil. In Ezekiel we read of the presence of God leaving Jerusalem because of an apostate nation. We don't read anything like that in the New Testament. The filling of the Spirit comes by yielding to the Holy Spirit, rather than quenching the Holy Spirit. The Holy Spirit is already in a believer and will not leave a believer, but will not fill the believer, that is, control him, when he is not submitted to the Holy Spirit. I don't know of one passage of scripture that says anything about sensing or feeling the presence of God. Maybe I could end this essay right there. What we do know is that God's presence is everywhere. That's called His omnipresence. He is present everywhere, but there is more to the presence of God than His omnipresence. God is everywhere, but He is with believers in a unique way (Is 41:10). God is everywhere, but He is in a unique way not in Hell, because only sinners are there (2 Thess 1:7-9). Before the Holy Spirit came, Jesus wanted believers to pray for the Holy Spirit (Luke 11:13). Once the Holy Spirit came, they didn't keep praying for Him to come, to be baptized by Him, even to be filled with Him. He's already there. You don't ask for what you already have. You just believe that you have it. That is living by faith. Jesus is said to walk in His churches or to be with the group (Revelation 1:19-2:1, Matthew 18:18-20, 28:19-20). He is not with the Laodicean church, but not because they weren't praying for Him to stay. He wasn't there because He wasn't welcome in the church, which is to say that the entire church had turned away from Him. This is an apostate church full of apostate believers, a church full of Judases. Further than the reality of God's presence is the sensing of God's presence or feeling of it. If God is there, how do you know He is there? It isn't through "sensing" it or "feeling" it. When people tell you they sense God's presence, it is akin to a Charismatic experience, where Charismatics attribute to the Holy Spirit certain events or activities that are unscriptural or non-scriptural. Most of those they are just making up, telling a tale. They're not true. I'm saying they're lies. It's the same with the sensing of God's Spirit. Men will say they sense the Holy Spirit with a voice of authority or with a complete sense of conviction. They believe they have sensed the presence of God. The statement is a kind of self-fulfilling prophecy. Someone wanted it, so he felt it, and then he reported it. Now it's true. It isn't true, except that he said it. What gives credence or authority to the one saying he sensed God is others saying nothing to refute it. They don't want to, because it's offensive to the one saying it. He'll argue. He'll become angry. It's normal for Charismatics to whom I talk. They want none of it. Usually they say you're unloving, because you questioned their experience. Christians will just give up on talking to this person and that adds to the experience. He thinks he's getting advocacy now. When no one speaks up, others think it's true. It must be. This person with great credibility said it happened. When someone says he sensed God's presence, it authenticates what he's done. What he's doing might not even be the right thing, but it is the right thing because he sensed God's presence while it was happening. That authorizes the event. Now it must be right and it can't be questioned. The authority comes from the experience. The sensing of God's presence is also considered to be evidence of an answer to prayer. Someone prayed for the presence of God, which wasn't necessary and was faithless, but he could say that he got an answer. "God is answering his prayers." Because God is "answering his prayers," then what he is doing must be right. It becomes a means of validation. What occurs then is that other people start looking for the experience of sensing God's presence. If they don't sense it, they think of themselves or feel like they are second class Christians. They are missing an experience that Christians are supposed to have. It's not true. They don't have to "sense the Holy Spirit or God." They don't have to feel anything like that. What should Christians expect that would indicate they are saved people and, therefore, have the presence of God in their lives, His special presence? It is objective evidence presented by scripture. As a brief summary, the presence of God shows itself: fruit of the Spirit (Gal 5:22-23), usefulness in the church (Rom 12, 1 Cor 12), boldness in preaching (Acts 4:31), obedience to scripture (Colossians 3:16), and the right relationships (Ephesians 5:18-6:6). Furthermore, a person remains faithful to God, endures in his faith in Jesus Christ, doesn't give up on the Christian life, and depart from the church. All of these manifest his abiding in Christ and Christ's abiding in him. These are objective and measurable. Every Christian can do them. There are no spiritual have-nots. If these of the previous paragraph are the objective witness of the presence of God in a believer's life, what is it that these other men feel or sense of the presence of God? It's very ambiguous with a lot of deniability. It's like a spiritual rorshach test. They can see whatever they want in whatever impulse or feeling. If you criticize it, they can just deny it. Was it a feeling? "Oh no!" Unless it was. At the moment of your question, no, it wasn't. They still had the sense though. What happens in five or ten or twenty years and the whole movement falls by the wayside? What's the explanation for the sudden disappearance of the presence of God? In most of these cases, God was never there in the first place. Someone depended on these highly subjective experiences, which weren't even true. What I've noticed is that the experiences are produced by people. They use music. They use a particular speaking voice. They create an environment that people can feel. They stay positive, their audience then feels positive, so they are happy. Their upbeat, happy disposition says, Holy Spirit's presence. These effects can be caused. Sometimes people feel guilt and they want to rid themselves of the feeling of guilt. When they don't feel guilty any more, absolved by the effects of a special service, they'll leave feeling better. It may be that nothing really happened, except for the impression that everything was now fine. It wasn't fine and it isn't, but they felt like it, so they assumed it was. Men should stop talking about sensing or feeling the presence of God. It isn't something anyone should expect. No one should look for it. Whatever feeling someone may have could only cause deceit or confusion. Being faithful to God, actually faithful to Him, requires trusting in the presence of God, whether the feeling is there or not.